Chemistrie Sunlenses are the first “click-on” clip-on—a durable, stylish sunglass product that matches the curvature of your glasses and attaches to the front of the lens using ingenious, virtually invisible embedded magnets. No bulky, bendy frames. No unsightly clips. Imagine—click on sunlenses that match the outer surface of your glasses perfectly. This allows for a lower cost, high-quality alternative to traditional clip-on sunwear, and expensive second pairs. Your cool glasses…can now become your cool sunglasses! You have the option to create a collection of clip-on lenses to include reader lenses and blue lenses to ease the discomfort of hours spent on your computer. Chemistrie Blue layers are finished with a special coating that reflects a portion of the harmful blue light from digital devices. With 3-D movies and televisions on the rise, it’s no longer necessary to wear clunky, 3D glasses overtop of prescription frames. Just simply snap on your Chemistrie 3D Lenses and you can comfortably view any 3D cinema production using circular polarization. These lenses also work with any TV using passive lens technology. 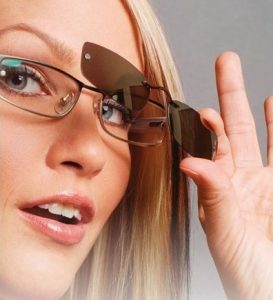 Chemistrie clipons really gives you the option to really customize your glasses to work for you for what you need. The possibilities are endless. Call our office today, 678-846-2000 to find our how they can work for you.